Lentils know no bounds. They’re the perfect high-protein, high-fiber food that take on just about any flavor you add to them. And speaking of flavor, I love spices. I felt inspired by the flavors of Morocco by this dish. Think paprika, turmeric, coriander, and pepper. 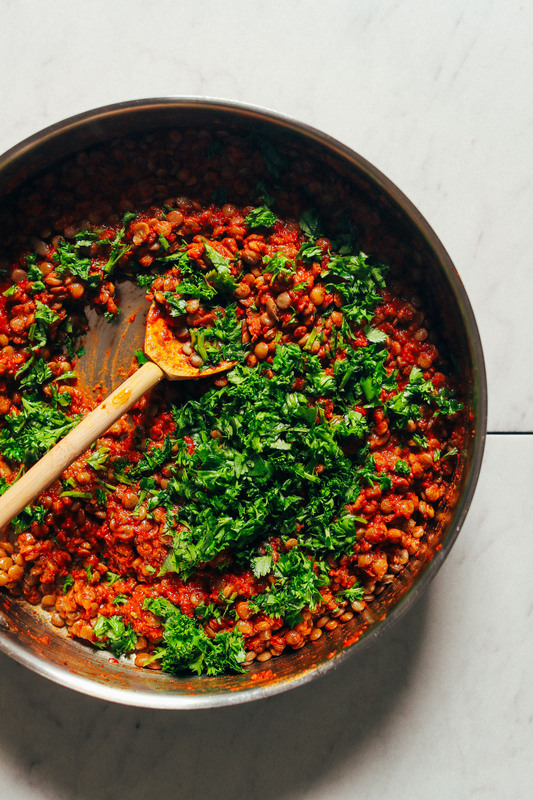 If you’re into saucy, smoky lentils, this recipe is for you. Let me show you how! This 30-minute recipe starts with cooking your lentils. And while that happens, it’s time for the sauce. To create a super flavorful and quick sauce, I blended onion, garlic, and red bell pepper with spices like turmeric, paprika, and cayenne. Tomato paste adds depth of flavor, and apple cider vinegar adds a little acidity. It’s the perfect mix of bold flavors I was looking for. All that’s left to do is add the sauce to the lentils with some fresh herbs – like parsley and cilantro – and stir to combine. Yeah, it’s that easy! This would make the perfect side dish or addition to salads, wraps, sandwiches, rice bowls, and more! I have an idea involving eggplant coming soon, so stay tuned! 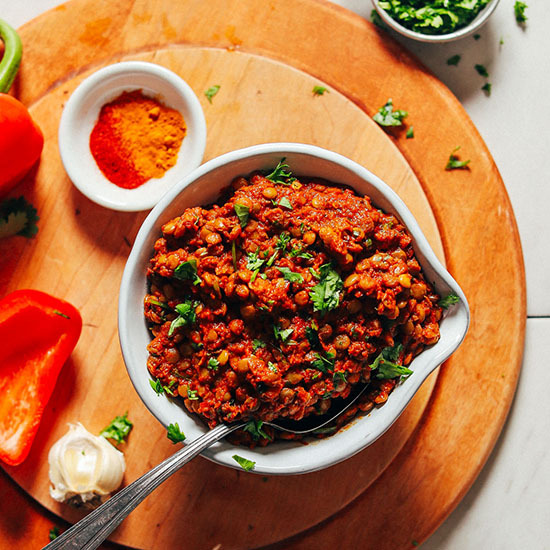 For more lentil dishes, be sure to check out our Coconut Curried Golden Lentils, Nourishing Sweet Potato and Lentil Bowl, Lentil & Eggplant Lasagna, 1-Pot Curried Lentil & Potato Soup, Curry-Roasted Vegetable & Lentil Salad, 1-Pot Red Lentil Chili, and Mediterranean Lentil Dip! 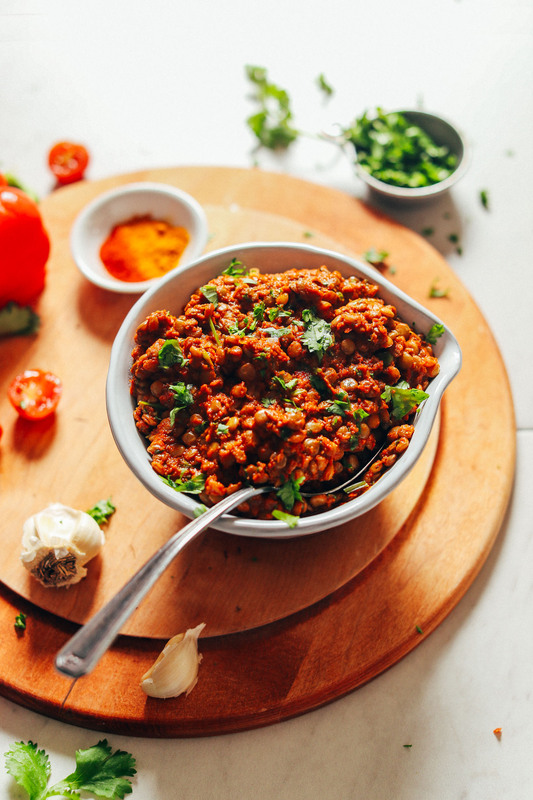 Flavorful, 30-minute Moroccan-spiced lentils with paprika, peppers, tomato, and fresh herbs. A healthy plant-based side or addition to bowls and salads! Cook lentils first by bringing 2 cups water to a boil and adding lentils. Bring back to a boil. Then reduce heat to low and simmer (uncovered) for about 20 minutes or until lentils are tender. 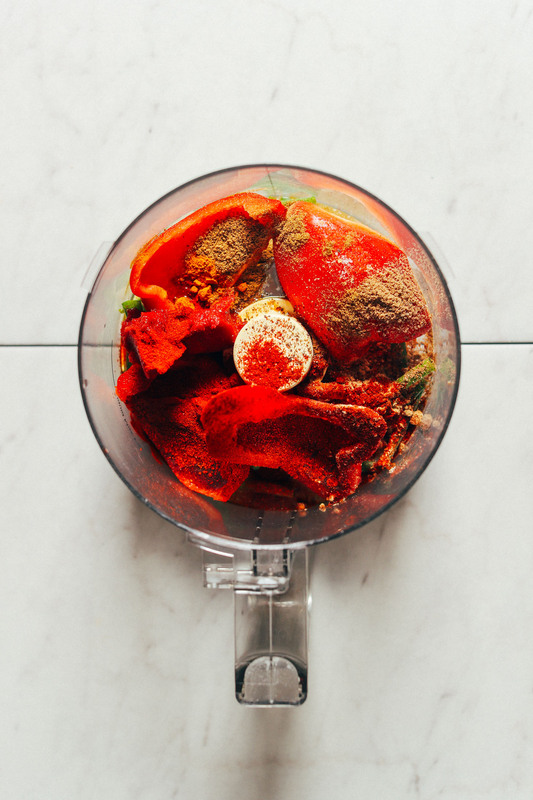 In the meantime, to a food processor or small blender, add garlic, onion or shallot, bell pepper, tomato paste, coconut sugar, sea salt, paprika, cumin, coriander, ginger, turmeric, cayenne pepper, and apple cider vinegar. Mix to thoroughly combine. 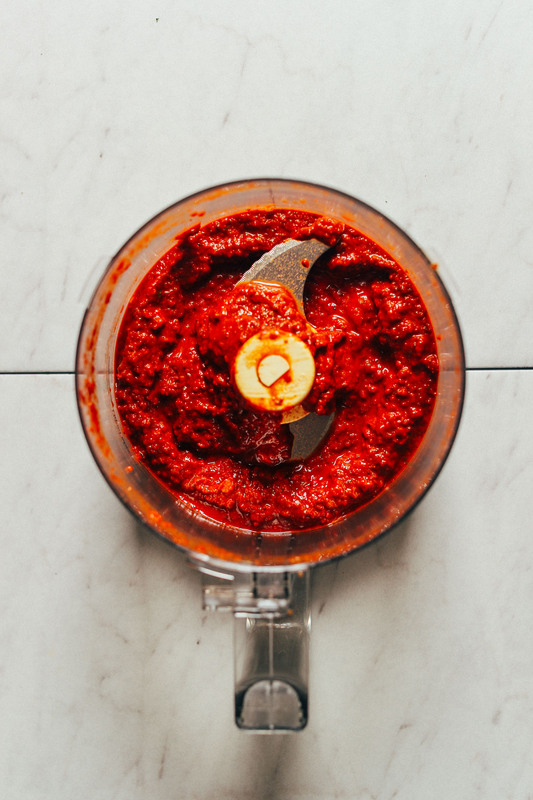 Taste and adjust flavor as needed, adding more tomato paste for depth of flavor, spices for more overall flavor (especially coriander and paprika), cayenne for heat, coconut sugar for sweetness, apple cider vinegar for acidity, or salt for saltiness. Set aside. Once the lentils have cooked, drain off any excess liquid and then add spice mixture and parsley or cilantro and mix well to combine (see photo). Enjoy immediately with salads, rice (or cauliflower rice), bowls, and more. Store leftovers in the refrigerator up to 4-5 days or in the freezer up to 1 month. *Nutrition information is a rough estimate for 1 of 6 servings.